string(1151) "Resource Centre > Uncategorized > Labor and Human Rights Risk Analysis of Ecuador’s Palm Oil Sector"
Ecuador’s production of palm oil has grown dramatically in recent years, making it Latin America’s largest producer. This expansion has heightened labor and human rights risks linked to palm production. Such risks include forced labor, unethical recruitment and hiring practices, wage and hour violations, child labor, discrimination against women and minorities, environmental damage, and displacement. The Ecuadorian government as well as palm oil producers and buyers can take certain steps to mitigate these risks, which are described at the end of this report. This report is the result of a literature review and 77 expert consultations and worker interviews carried out by Verité in Ecuador. The research focused on the provinces with the highest levels of African palm cultivation: Esmeraldas, Pichincha, and Santo Domingo de las Tsáchilas, as well as the Canton of Las Golondrinas. Emphasis was placed on Esmeraldas, the province with by far the highest amount of African palm cultivation as well as the highest number of Colombian immigrants, who are particularly vulnerable to labor exploitation. The research was qualitative in nature and sought to uncover information about the presence and characteristics of labor and human rights risks. While workers from a variety of regions and employed in a range of locales and occupations were interviewed, the sample cannot be said to be statistically representative at a national or sectoral level. 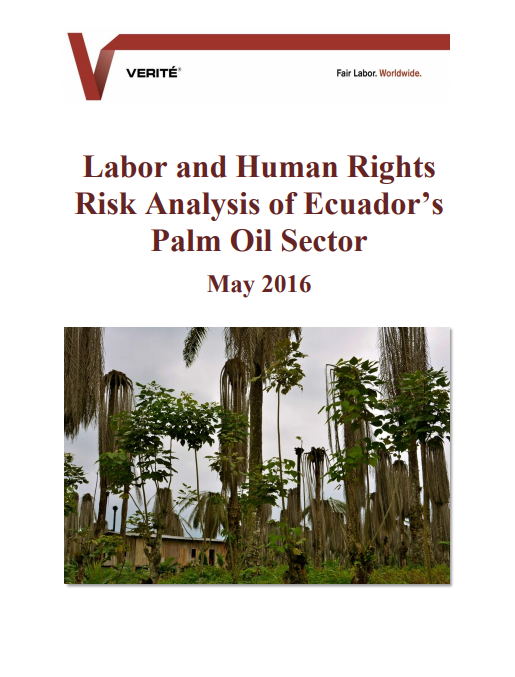 Several factors coalesce to heighten risks of labor exploitation for the more than 150,000 workers involved in palm production in Ecuador. Palm oil requires far fewer workers than most other crops, leading to a high level of competition among workers for scarce jobs, which renders them easily replaceable and thus unable to protest poor conditions. Palm plantations displace people from their land and reduce alternative employment opportunities, creating a pool of workers whose only option for work is on the plantations. In addition, labor brokers manage much of the palm sector’s workforce, distancing palm producers from responsibility for working conditions and shielding them from legal liability for violating labor law. Colombian immigrants, including refugees, frequently work in Ecuador’s palm sector, where they are especially vulnerable to labor and human rights violations. They often face discrimination and threats of deportation, constraining their ability to protest unfair labor conditions. Vast numbers of refugees flee Colombia, which has the second highest rate of displacement in the world after Syria. The large majority of Colombian refugees migrate to Ecuador. While some immigrants interviewed were able to obtain asylum and legal status, many Colombian immigrants were forced to remain undocumented in Ecuador, due to changes in the country’s asylum system prior to research, making them especially vulnerable to exploitation. Colombian refugees were fleeing from violent armed groups in Colombia, which have also established a presence in Northern Ecuador, further increasing their vulnerability in Esmeraldas. Verité research found indicators of forced labor, including indicators of unfree recruitment, work and life under duress, and impossibility of leaving employers, especially among Colombian immigrants. Palm companies and labor brokers deceived workers about working and living conditions on palm plantations, luring them into jobs with far worse pay and conditions than expected. Palm workers were reportedly paid as little as a sixth of the amount originally promised to them and were forced to work overtime, sometimes without pay. Workers also faced limits on their freedom of movement and communication, including curfews, constant surveillance, and supervision by armed guards. Workers depended on their employers not only for their incomes, but also for food and shelter, which restricted workers’ ability to leave. Furthermore, some workers fell into debt due to deductions for food and housing that were often of poor quality. There were also reports that employers withheld workers’ wages and threatened workers with physical violence, reporting of undocumented workers to authorities, and worsening of already poor working conditions in order to prevent them from seeking assistance or protesting unfair treatment. Verité’s research also uncovered additional problems faced by palm workers. These risks included wage, benefit, and working hour violations; child labor; discrimination against women, indigenous people, and people of African descent; health and safety risks; poor housing; environmental damage; harm to indigenous communities; and inadequate grievance mechanisms. It is imperative that the government of Ecuador and palm oil companies take urgent steps to combat labor and human rights risks connected to palm production. Verité recommends that the government of Ecuador build the capacity of the labor inspectorate, improve services for victims of forced labor, promote measures to detect and prosecute cases of forced labor and labor exploitation, strengthen mechanisms for registering worker grievances, and carry out measures to better protect asylum seekers from labor exploitation. Verité recommends that palm oil producers and buyers assess their supply chains for labor and human rights risks, build the capacity of their staff to understand risks related to palm oil production, implement grievance mechanisms to allow workers in their supply chains to lodge anonymous complaints, and engage in policy advocacy and stakeholder dialogue.